VAMPIRINA is hitting DVD tomorrow, and we’re sharing a new activity button! Vampirina is the new girl in town! 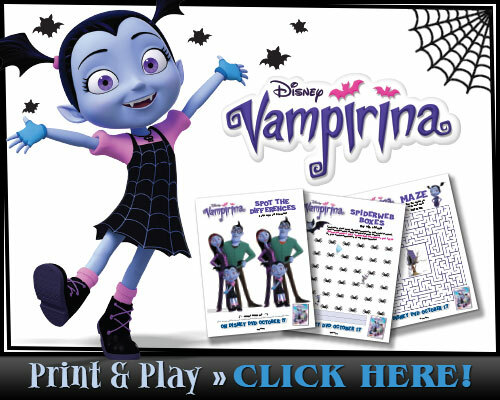 Join Vampirina “Vee” Hauntley and her new human friends as she brings spook-tacular fun from Transylvania to Pennsylvania! Whether making their “Spine-Chiller” music videos or planning parties for friendly Transylvanian guests, Vee and her friends always figure out how to have fang-tastic adventures! To date, “Vampirina” has amassed nearly 28 million Total Views including reaching 17 million Total Viewers via linear TV, including amassing a substantial 10.4 million full-episode views on YouTube. Inspired by Disney Publishing’s popular children’s book series “Vampirina Ballerina,” written by Anne Marie Pace and illustrated by LeUyen Pham, the series includes leaders from the creative team on Disney Junior’s Peabody Award-winning animated series “Doc McStuffins” including creator/executive producer Chris Nee and co-executive producer Norton Virgien. Nicky Phelan (“Octonauts”) serves as director. Broadway composers Michael Kooman and Christopher Dimond (“The Noteworthy Life of Howard Barnes”) are the series’ songwriters, and Layla Minoui (“Castle”) is the composer. Each episode of “Vampirina” features two 11-minute stories and one original song. The series is produced by Academy Award®-nominated animation studio Brown Bag Films in association with Disney Junior.